Custom fortune cookies are a yummy way to get YOUR message across. An added touch for special occasions and parties or as a promotional gift. 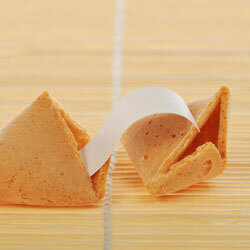 Your custom fortune cookies are baked fresh to order and come individually packaged in clear cellophane. Interested in further customizing your cookie's message with a photo or graphic? Contact us to learn more.